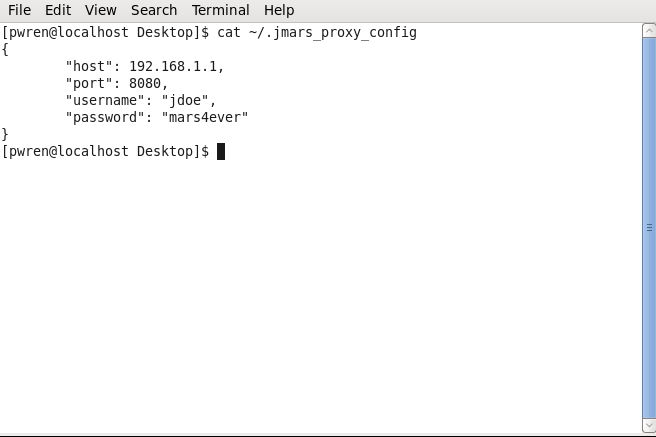 If the computer you are using is behind a firewall, i.e., you do not have open and free access to the internet, JMARS can be configured to communicate through a proxy server to retrieve maps and spacecraft images from our servers at the Mars Space Flight Facility. "password": "< password goes here>"
Save the file with the name .jmars_proxy_config in the home directory of the user account your are using. You are now ready to run JMARS! If you have any questions about setup, or encounter any problems, please contact us at help@mars.asu.edu.